This request is not appropriate at the time of a child’s circumcision. “May this be the hour of mercy” is a request to God to see suffering and heal it, to see the severity of a problem and fix, a request for forgiveness and mercy. The brit milah is the ritual circumcision of Jewish boys, eight days after their birth. At that time the child officially enters the covenant between God and the Jewish people and his name is announced to the public. The act of circumcision, marking the completion of the body, is a human act. This signifies that our spiritual, emotional, moral and ethical perfection requires human effort. God cannot do it for us. The covenant with God requires hard work. This is a very emotional ceremony. It is very common to see the baby’s mother cry during the brit – seeing the physical act of the circumcision is not easy. Awareness of the continuity of generations who have completed the exact same ritual for centuries adds to the emotional weight. Even so the brit milah is a time of joy. At least it is supposed to be. 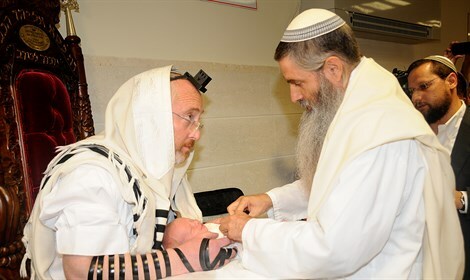 Today Erez Yechezkel HaYisraeli was circumcised and given the name his father chose for him. The tears in Rivka’s eyes were probably less for her son and more for her husband, lying next to them in an medically induced coma. Yehuda Yitzhack HaYisraeli should have been holding the baby. He should have recited the blessing announcing his son’s entrance in to the Jewish covenant with God. Instead of purely rejoicing for the newborn, the participants prayed for the father. May this be the hour of mercy. May God have mercy and heal him. May he be able to hear his son, sit up and ask to hold him. Yehuda had been with his IDF unit, the Givati Brigade, in Gaza. You could say he was fulfilling a different aspect of the covenant – protecting the people of Israel and the land of Israel. 27 days ago he sustained a severe head injury and has been in a medically induced coma since. The brit is normally conducted in a celebratory location – an event hall, synagogue, a home… Erez Yechezkel was circumcised in the hospital so that his father could be part of the ceremony that is such an important milestone in the child’s life. The medical staff carefully wheeled the comatose father in to the room. The attendees witnessed the circumcision, learned the child’s name and prayed for the father. Joy mixed with sorrow washed with hope. What is more appropriate than the prayer: “May this be the hour of mercy”? May Yehuda Yitzchak heal. The doctors say there is hope for him but no one really knows what the future holds. Brain injuries are complex, mysterious even to the most experienced surgeons and very complicated. May the brit of his son be the hour of mercy for Yehuda Yitzchak, for his family that loves him, his parents and brother (who also fought in Gaza). May his healing be complete so he can be a father to Erez Yechezkel, a husband to Rivka. How symbolic that this family’s name is “HaYisraeli,” meaning “the Israeli”. Their story is the Israeli story: sadness mixed with joy, sacrifice, love, steadfast loyalty and the strength to bring up new generations. May this be the hour of mercy for the Israeli family – for Yehuda, baby Erez and the entire Nation of Israel. It’s not just a BOOM. The ground shakes and you shake with it. Thanks for publishing my article!